And I am going to start by just opening up my thoughts to you and letting you in on some of my thinking this past year that has helped me. I’m just gonna be real here for a bit. UPDATE: I am re-recording this audio now in October, 2015. Ten Months AFTER I originally posted this. I wanted this audio for my podcast and when I listened to it, I realized what a dramatic difference in the way I present now versus then. At first, I was a bit disappointed, but then I realized that WOW, my plan worked! Here is the updated audio for the podcast. You can also click here to listen. So today is a bit of a narcissistic case study on myself. A few lessons I learned on growth acceleration this year. For the past 10 months I have made a very conscious effort to work on my authenticity. I re-listen to sales calls, how I open up dialogues, and what I say when I speak and train others. The big idea here is that it’s not WHAT you say, it’s HOW you say it. As I listened to my old audio, I could hear very clearly that I was reading. Good info, just not with the impact that comes with authenticity. Ultimately, the more I work on myself, the better I can serve my customers. That is the true meaning of a Sales Hero. And it is what I encourage everyone to do. Make sure you do the hard work to make it look easy. I wanted to take some time here and simply share with you the impact of working on your authenticity consistently over time. And to continue to work on it long term. It has absolutely accelerated my business growth, created faster connections with others, and made selling effortless. Ultimately, the more I work on myself, the better I can serve my customers. That is the true meaning of a Sales Hero. The original audio is below if you want to compare it! A month ago, I stepped back and re-evaluated what I was doing. You know, what do I want to be when I grow up? The easiest answer is that I never want to grow up, so that’s cool. I’m curious how many other people get to December each year and begin to over-think what they want to do the next year. Are you like that? Even though it is a time for relaxing and slowing down to spend time with loved ones, December actually becomes more hectic, I end up spending more, and this terrible feeling of “Am I ready for next year” creeps in. I know I’m not alone. I hate setting goals in the new year. Let me explain. Each year as we get closer to January, I get this sense of obligation to goal setting that I never asked for. Almost like I am a prisoner to the process and that everyone else is doing it. You know what I mean? And it almost feels like if I don’t carve out time to plan my next year, I wont be successful. I mean, I look at all these New Year’s Resolution posts, goal setting, and motivational crap that just sort of spews across my computer screen and, to be honest, it gets overwhelming. But hold on, I have a 90 Day Sprint goal Setting program! What a hypocrite! Here’s the secret. Goal setting is powerful stuff, man. But goal setting just for the sake of doing it actually adds more stress. I remember looking at my life a while back and working through all the steps that it would take to become homeless. I figured if I just stopped doing absolutely everything today, it would take close to a full year to become homeless. And that was if zero people came to help. This meant that nothing terrible was going to happen to me and that everything I did each day was my choice. I chose to have that job, I chose to start that business, and I chose to spend time away from my family. I also choose to pay my bills, walk my dog, and use the washroom. No one forces me to do any of these things. So when it came down to looking at goal setting for the year, I made a choice to NOT do it…yet. Do you ever feel like you’re not doing enough? Does this ever happen to you? You have a project you need to work on but feel tired. You have two options – keep working or take a nap. If you take that nap, do you toss and turn and feel guilty that you’re not working? Likewise, you keep working and feel like you are punishing yourself for not taking care of your body. No matter what you do, you feel like you are doing something wrong, right? It’s this constant internal battle and we beat ourselves up non-stop! Go read The Power of Now by Eckhart Tolle if you haven’t already. The biggest lesson was: no matter what you do, go into it fully – even if that means being lazy. If you want to lay on the couch, go into it fully. If you are doing work, go into it fully. If you are having a conversation with your husband or wife, go into it fully. In today’s over-informed, hyper-connected, socially-unpresent world, we miss opportunities each day to fully live our lives and truly be more authentic in the things we do. Last weekend I had planned on finishing my book. I started Friday night and continued on Saturday morning. I wrote about 5,000 words and was making great progress. I was following my own advice from last week’s post on getting one thing done. But then I realized I had forgot that it was NFL playoffs! Again, the choices…guess what I did? I watched football. And I loved it. I went into it FULLY. So I took December as a time to actually reflect on the year and I resisted the urge to plan. It was hard! I made sure I had downtime and spent time with my girlfriend, family, and friends. We even rented a cabin with no cell service, no internet, and no TV. Just sat in the hot tub on the deck overlooking the ocean, and drank whiskey. Perfect. Keep in mind, that this whole goal setting thing was nagging at me and I couldn’t shake it. I mean, I have a blog and shouldn’t I have some sort of obligation to my readers to make sure they have a great goal setting, New Year’s post? Am I letting them down? What about my business? Shouldn’t I map out my strategy? The answer was a YES…kindof. What are the things that I’ve struggled with, learned lessons from, and found ways to succeed that are things other people are most likely struggling with as well? How can I help them succeed? That was the ah-ha moment for me. If I was struggling with goal setting and feeling the stress of the new year, I’m sure others were too! That’s why I decided to write this post. You don’t need more strategies for setting goals (but seriously do check out the 90 Day Sprint). I realized that what people want are insights on their own behaviors, how to overcome challenges, and ways to achieve success. If I simply went through the motions, I wouldn’t be doing you any favors. What about you? What goals are you setting just because? Are you taking the time to align your goals with your reason why? Or are you just jumping into it for the sake of doing it and adding more stress to your life? For me, I have big plans to do more videos this year, launch my podcast, and do more webinars. Also I am writing, speaking, training, and consulting all over the place. Add to that client calls, networking, and even personal relationships, and I am going to be connecting with people a lot! And that means many opportunities to be myself and be more authentic. What I’ve found is that I have to throw out quite a bit of video that I shoot simply because I sound like a wannabe marketing douchebag. It’s not really me. Shooting video is hard when you are trying to be authentic. So I ask my girlfriend to tell me if the videos are really me or someone I’m trying to play on TV. It definitely helps. Now, if you are in sales, this piece of advice is the golden ticket, my friend. Self check number one: Before I do any of these activities, I ask myself if it is truly me. Is this my true self and is the message something that is in my DNA? Have I set my intentions to be 100% on? Self check number two: At what point in the conversation did I become authentically me? That is where the REAL conversation starts. Self check number three: Ask others to call me out when I am not being my true self! Not really a self check, but an accountability measure. The second one is actually now a metric I am tracking. Have you ever started a conversation and been somewhat robotic for the first bit? You maybe wanted to sound smart, perhaps. And then, once you get comfortable or laugh, you become the real you? That is what I mark on my notes now. How FAST can I be authentic? The faster I am, the easier it becomes. And when I dive into some of the psychology stuff over the next while, you will see how truly powerful this process is. That is my only real resolution – just be 100% me in all the stuff I do. I think that will make it an awesome year and quite stress-free, no matter how busy I get. And I’m going to check my ego, be more vulnerable, and just love what I do. Major Note: This was not about trying to avoid my business or the work I needed to do. Now that I have worked through this process, the rest of my goal setting will be true to my vision and I can plan my year with a clear head. My goals of driving my business forward are more meaningful now. And I will be MORE successful by taking this time to reflect than if I would have just jumped right in. I plan to have my biggest year ever! At the end of the year, we’ll see how this all plays out! As I have been working on this all year, I would give you one easy thing you can do to build this skill. Record yourself. Listen to how you present and see how it makes you feel. Would YOU buy from you? Does your message make YOU smile? Do this little bit of uncomfortable work consistently over time and you will see dramatic results. Today was a much more personal post and I wanted it to be somewhat relieving for you if you have been getting worked up about goals. You still need to set goals, make plans, and be prepared, but OWN whatever you do. Design your life and make choices that matter. It’s too short to get caught in another year of the same old stuff. I would love to hear your comments on this, so post them below! What goals do you have this year? 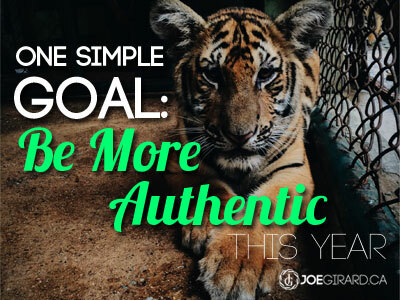 How have you found authenticity helps?